Welcome to this week’s edition of “A Sales History.” This week we will be taking a look at the sales history of the Cal of Duty franchise. Last week we looked at sales history of Mario Kart and the week before that Uncharted. If there is a particular franchise (no matter how obscure) you want to see the sales history for, requests are always welcome. The Call of Duty franchise is a first person shooter, with two main developers Infinity Ward and Treyarch. The franchise has taken place in World War II, the Cold War, modern times, and Black Ops II set to release later this year will take place in the future. 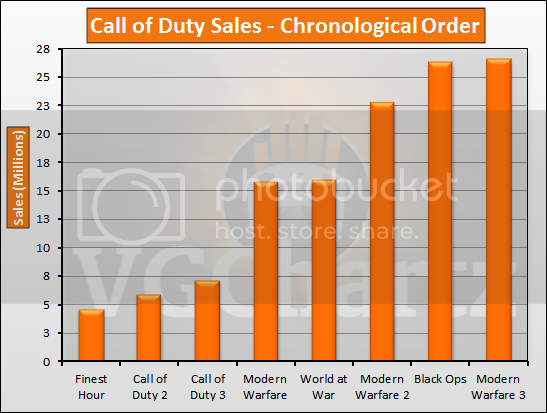 In the chart above, the Call of Duty franchise has achieved lifetime to date sales of 124.65 million on consoles. The Modern Warfare trilogy has sold a combined 64.92 million units, a little more than half of the total sales. The first three games were popular; but it was in a crowded market of World War II shooters. It wasn’t until the release of Call of Duty 4: Modern Warfare that the franchise took off to become one of the bestselling games on a yearly basis. Looking at the bar graph above, it is easy to see that the franchise has grown steadily for each release. The second and third game grew at a decent rate 1.29 million and 1.26 million, respectively, however Modern Warfare more than doubled the sales of the previous games. World at War sales remained even with Modern Warfare. With the release of Modern Warfare 2 the series took off even further selling 6.71 million units for than World at War. Black Ops continued this trend by selling 3.52 million more units. Modern Warfare 3 despite being out less than a year has already become the bestselling game in the franchise by recently passing Black Ops. Looking at the total sales by the current generation consoles it is clear that the franchise has become the most popular on the ‘HD Twins.’ They make up 95 percent of the market for the game selling a combined 105.27 million units, compared to just 5.66 million for the Wii. The Xbox 360 games have sold a combined 59.85 million, compared to 45.42 million for the PlayStation 3. 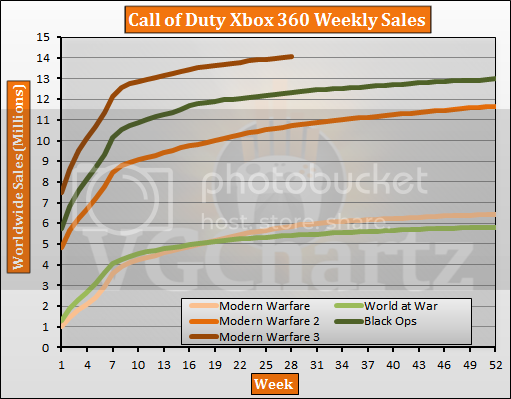 Looking at the weekly sales of the five big Call of Duty games for the Xbox 360, starting with Modern Warfare shows how much bigger the series has become at release. Modern Warfare and World at War sold a similar amount through their first year, 6.45 million and 5.82 million respectively. On the Xbox 360 Modern Warfare outsold World at War, 8.64 million compared to 6.73 million. First week sales have increased consistently increased for each release, from 1.0 million up to 7.5 million. First week sales for Modern Warfare were 1.0 million, World at War 1.28 million, Modern Warfare 2 4.81 million, Black Ops 5.73 million, and Modern Warfare 3 7.5 million. Modern Warfare 3 for the Xbox 360 holds the current record for most units sold on a single platform. 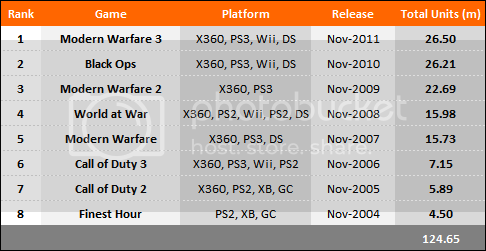 Looking at the weekly sales of the five big Call of Duty games for the PlayStation 3, just like with the Xbox 360 versions, starting with Modern Warfare shows how much bigger the series has become at release. Also like with the Xbox 360 versions, Modern Warfare outsold World at War, 6.11 million compared to 4.85 million. First week sales have increased consistently increased for each release, from 421,000 up to 5.38 million. First week sales for Modern Warfare were 421,000, World at War 751,000, Modern Warfare 2 3.21 million, Black Ops 4.39 million, and Modern Warfare 3 5.38 million. Modern Warfare 3 holds the current record for most games sold in its opening week on the PlayStation 3. Call of Duty: Black Ops II has already been announced and is set to be released for the Xbox 360, PlayStation 3 and PC. The game will be released on November 13 and in only a few weeks has already entered the top 20 most pre-ordered game in the US. 26 weeks away from launch and the Xbox 360 version already have 56,131 pre-orders and the PlayStation 3 version 37,706 pre-orders. 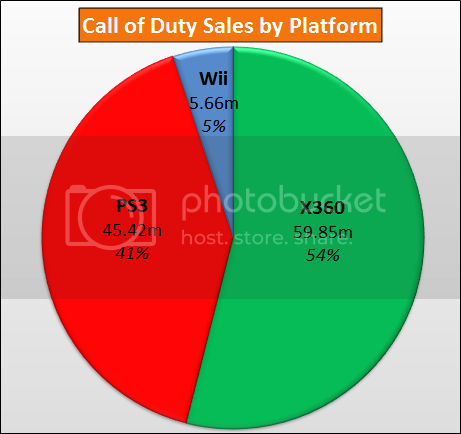 To put this into perspective this is two weeks ahead of the Xbox 360 and PlayStation 3 versions of Modern Warfare 3. Despite the lower sales in consoles compared to last year, the user base is still increasing and Call of Duty: Black Ops II is most likely going to sell similar to Modern Warfare 3 if not surpass it slightly. Expect Black Ops II for the Xbox 360 to sell anywhere from seven to eight million units opening weeks and lifetime sales around 15 million. Expect the PlayStation 3 version to sell anywhere from five to six million units opening weeks and lifetime sales around 12 million. November 2009: The age of Codism began......Developers got the notion that if they copied Call of Duty they'd be successful as well. Did that ever fail. I request next Sales History cover the Elder Scroll series from the original to Skyrim including expansion sales if possible. I wonder how much of the Wii deficit has to do with (1) it not getting MW2 (which meant one fewer game and no reason to buy MW3) and (2) the omission of CoD3 which was the first CoD game on the Wii and sold the best (over 2M copies, more than the PS3 version). Looking at it, Modern Warfare 2 is technically the best selling title of the Call of Duty games. Since it sold (almost) 23 million units across only 2 platforms. With all these sales related articles one thing that stands out is most "popular" series have diminishing or sporadic sales but the CoD games have a clear trend of growing its audience. Kudos to them for making sure each new entry is not just enjoyed by existing fans but also accessible for new comers. They missed the sales from modern warfare reflex Wii on the sales overview.Thats at least another 1.5 million to be added. Nice to see that Treyarch owns IW with every game. 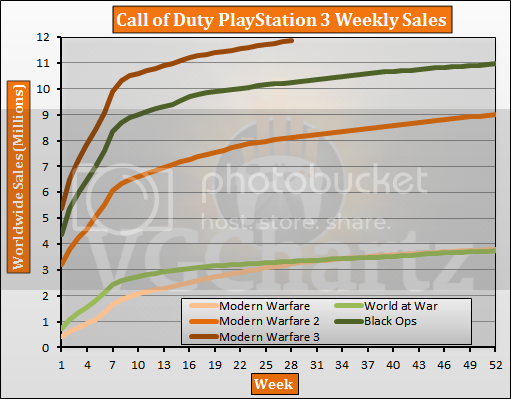 Hopefully Black Ops 2 outsells MW3. I think Treyarch is far better at making COD games than IW. Don't really agree with your Treyarch statement at all. I feel that COD4 was the best game of the series and it's really just been repetitive and downhill from there. Guess it's not to say that the games since then have been bad, they are good, but I feel like they are all still riding the coattails of COD4. Played both MW2 and BO after that game and got bored pretty quickly.